Although both belong to the pine family, spruce and cedar significantly differ in longevity and visual weathering characteristics. Lumberyards and home improvement stores regularly offer both spruce and cedar for fencing materials, exterior siding and trim. Importantly, spruce and cedar products differ not only in initial cost, but also lifetime maintenance requirements. If you learn about the characteristics and costs of spruce and cedar you can choose a material that accommodates your climate, suits your project's visual design and meets your budget. 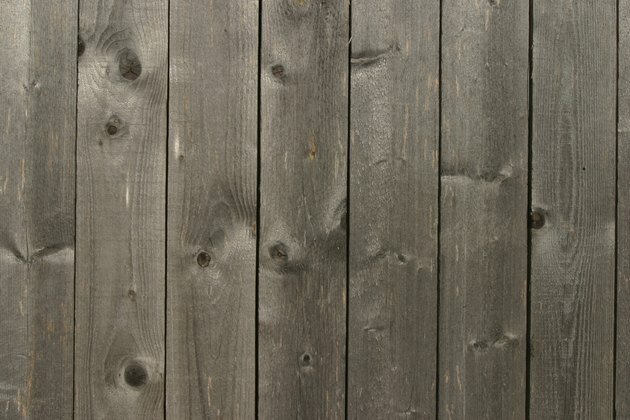 Frequently used for fence construction, cedar weathers to a dull gray. In the North American market, spruce belongs to a category of trees called whitewoods. Depending on the mill or retail establishment, whitewoods include several types of pines and occasionally fir. The spruce offered for exterior applications exhibits moderate rot and pest resistance. Treatment with chemical preservatives and waterproofing compounds greatly increase spruce's resistance to deterioration. Under natural weathering conditions spruce's creamy white color slowly changes to a light silver. However, spruce and other whitewoods readily accept both paint and stain. If properly applied, paint and stain can increase the woods' resistance to deterioration. Unlike spruce and similar whitewoods, cedar exhibits natural resistance to both rot and pests. Like redwoods, true cedars naturally produce compounds that prevent damage from rot, fungus and many pests. Therefore, cedars offer a high degree of resistance to deterioration, particularly compared to spruce. Because of cedars' high resistance to deterioration, many builders install untreated and unsealed cedar products in exterior applications. Installed without chemical treatment or waterproofing, cedars' natural reddish hue changes to a dull gray. Although lumberyards occasionally market spruce for fencing, siding and exterior trim are spruce's most common application. Spruce's exhibits easy workability, a term that refers to the ease of milling the lumber. Spruce's easy workability lends well to several types of decorative siding and trim. Common spruce siding styles include lap siding, bevel siding and tongue and groove siding. Spruce is available in standard trim dimensions, both smooth and rough-sawn, for window, door and siding trim. Cedar applies to nearly any outdoor building project. However, cedar's exceptional resistance to decay leads builders to use cedar for particularly exposed projects, such as fence boards and finished deck surfaces. Lumberyards and home improvement stores commonly hold large quantities of the ubiquitous dog-eared, cedar fence boards. Alternatively, cedar planks hold up well under stress and direct exposure to weather as deck planks, posts and railings.